Infectious skin diseases are also known as contagious skin diseases. It means that the rash can spread from one person to another, by skin to skin contact or by touching a surface like table tops, bedding which has the germ on it. The infecting organism can be a virus, a bacteria or a fungus. It can get into skin commonly through a minor scratch or cut which damages the skin surface and destroys the barrier to infection. Described below are some common infectious skin diseases which can affect both adults and children. Ring worm infection is a highly contagious skin disease. It has nothing to do with worms, but it is caused by a fungus. It can appear in any area of the body. 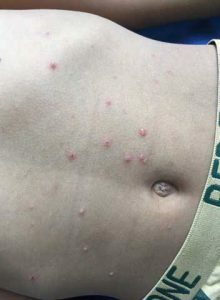 The rash is red or pink with a ring like pattern, a raised border which is sometimes scaly and center of the patch clears up when the lesion increase in size. It can be associated with Athletes foot and Jock itch which are also fungal infections. Ring worm infection is a very itchy rash and scratching can lead to infection. It is common in people who live in warm, humid climates. It can occur in people with diabetes, obese individuals and people with poor hygiene. Management is by starting an appropriate antifungal cream. Treatment is long term (up to about 6 weeks). Usually after total clearance, continue applying at least for 1 more week as there is a chance of reappearance of the rash in a few weeks if the fungal infection is not cured properly. Keep the rash area clean and dry. Prevention is better than cure. Shower twice a day, if you sweat a lot and if you live in warm humid conditions. Wear clean clothes, socks and underwear daily. Since Ring worm infection is very infectious do not share your towels or clothes with others. Scabies is caused by a mite who burrows in to skin. The reaction from the skin towards the mite causes a red, papular (like bumps) rash which is intensely itchy. It is a common skin condition which is highly infectious. It is spread in overcrowded places like extended care facilities, homeless shelters and nursing homes through bedding and furniture. That doesn’t mean that people who practice good hygienic practices cannot get the infection. Scabies can be treated easily by prescription of a scabicide (Medicine that kills the scabies mite). However adherence to the instructions during treatment is a must for cure. Medication should be applied all over the body except face (neck down up to toes). As scabies is highly contagious, treatment should be done not only for the patient but his or her close contacts as well. Treatment is not complete unless you wash and dry your clothes, towels and bed linen as well, because the mite can survive in these and re-infest the person. Chicken pox is an infection caused by the Varicella zoster virus. 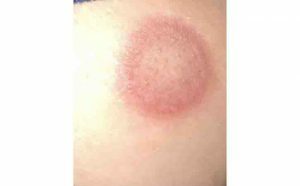 Rash is itchy and painful with small fluid filled blisters (vesicles). As it is highly contagious, patient needs isolation. Chicken pox can be associated with cold symptoms and fever. When blisters are broken, scabs and crusts appear over them and usually heal within 2 weeks. Calamine lotion can be applied over the rash to soothe the area. OTC Acetaminophen (Tylenol) can be taken for pain and fever and an antihistamine like Loritidine/ cetirizine/ fexofenadine or chlorpheniramine can be used to relieve symptoms of cold and itching. Once Chicken pox rash is resolved, the virus stays dormant inside the body. It can reactivate during periods of low immunity such as in elderly, cancer patients, then it is called shingles. It is a very painful rash which occurs in a certain area of the body with blisters. The pain can last up to 2-3 weeks even after rash settle. That pain is referred to as post herpetic neuralgia. Try an over the counter pain killer like Tylenol (acetaminophen) or ibuprofen to reduce pain. But it is better to seek medical help especially if rash worsens and pain is unbearable. Shingles can be prevented by giving Shingles vaccine to people over 50 years of age. Cold sores or Non-genital herpes is caused by Herpes Simplex Virus type 1. 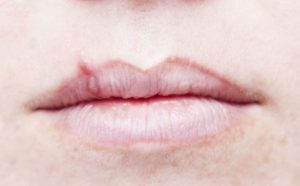 It usually appears as blisters and sores around lips and chin. They can be painful. The lesions can last for 2-3 weeks and heal without any scars. They are infectious as the virus can spread from saliva. It is a common skin infection by Human Papilloma Virus. The lesions appear like skin colored, small, round growths or fleshy bumps which has an irregular surface. Viral warts are highly contagious and can spread to various areas of the body and from person to person by touching. Use of wart remover patches for 3 days and soak with warm water. Then gently scrub the wart with a pumice stone or an emery board. There are OTC solutions like Salicylic acid which can be applied over the wart to burn and peel off. If the home remedies does not work or if they are painful or interferes with your day to day activities seek help. The doctor can prescribe a solution with higher concentration of Salicylic acid or Tri Chloro Acetic Acid (TCA) to apply on the warts. If not responding Cryo therapy may be tried by the doctor. 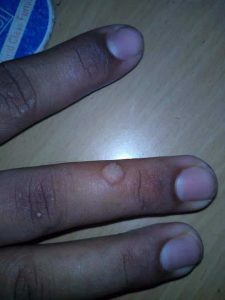 That is applying liquid nitrogen to burn and freeze the warts. Impetigo is a bacterial skin infection (by Staphylococcus or Streptococcus) commonly occurring in children. The bacteria get in through damaged skin. It appears as blisters with honey colored crusting anywhere in the body. It usually clears within a few weeks. Since it is contagious and spread by touch, better to seek help as the rash will improve faster with treatment and reduce the risk of spread to others. It is a viral skin infection which can spread from one person to another due to skin contact or by sharing towels or clothing. There are pinkish or flesh colored bumps which can appear anywhere in the skin. There is a central dip when you have a closer look at the bump. One can get around 10 -20 lesions. However there may be hundreds of lesions in immune compromised patients (as in AIDS and cancer patients). It is important to seek help from a dermatologist to prevent spread to other areas of the body and infecting others. Cryo treatment (applying liquid nitrogen to freeze) or applying strong acids like TCA to burn are commonly practiced therapies to get rid of the lesions. Usually this is commonly seen in children, although it can occur in adults too. This is a viral infection and it is contagious (spread from one person to another). Red spots occur on palms and soles, which can be like red color skin bumps or flat lesions. They may occur over buttocks, knees and elbows too. The patient is usually ill with fever. Associated painful red sores or blisters on lips, gums and tongue will make it difficult to swallow. Fever can be controlled with acetaminophen and lot of rest is necessary. Fluids should be taken adequately. Calamine lotion can be applied over the rash for soothing effect. Infectious skin diseases are best prevented by cleanliness and avoiding contact with those who have infectious skin diseases as it is also said that all kinds of skin diseases can treated with cleanliness and proper hygiene. If you get such an infection, make sure you stay at home to prevent spread and to seek medical help when necessary. Our AI enabled skin care app is capable of finding a solution for all kind of skin diseases. Check your skin condition now!